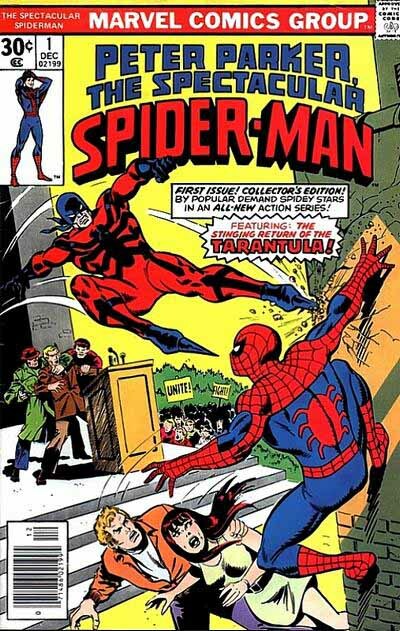 As Marvel Comics surfed into the 70s on a growing wave of popularity, THE AMAZING SPIDER-MAN continued as one of, perhaps THE most popular title for the company. 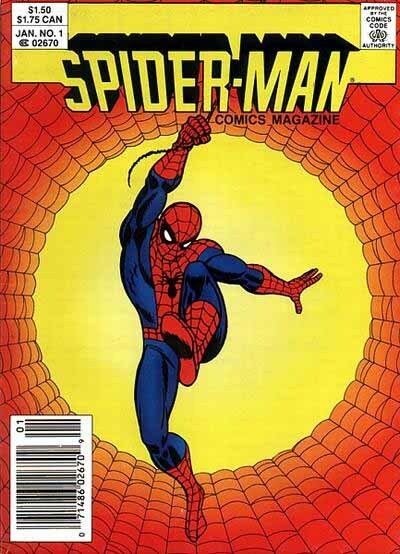 The logo stayed mostly the same, though at some point the words THE AMAZING were brought closer to SPIDER-MAN, making for a more compact logo that left room for trade dress and art. The webbing came and went, as the art required. On issue 115, above, it got star treatment, but that was unusual. With issue 125 a new, simpler webbing came into use, harking back to issue 1, but even more open than that. I’m sure it made the production guys happy, and it looks okay to me, but not as interesting as what had gone before. Finally by the mid 1970s Marvel found a new distributor, and with restrictions off, began expanding their comics line like crazy. GIANT-SIZE SPIDER-MAN was only one of many such Giant-Size books. I discussed the logo design of these in my X-Men logo study last year, and wasn’t able to come up with a designer, but it was surely someone on staff in the Marvel bullpen. Nothing about the Spider-Man logo on this cover works well for me. The S looks like it belongs to a different font than the rest, and the squared block letters are very uneven. But these mash-up titles were never going to look good with so many diverse styles crammed together, so let’s just leave it at that. 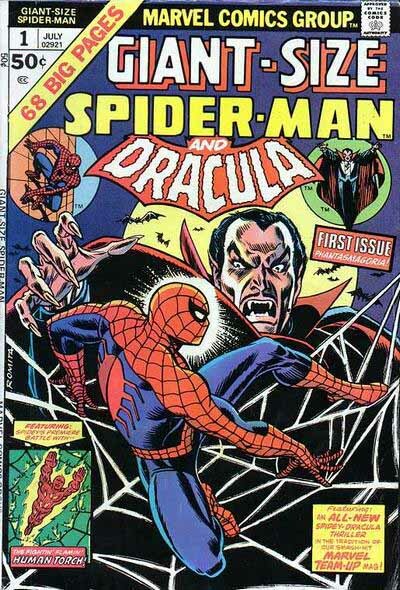 1976 saw the launch of a second regular monthly Spider-Man title, reviving the SPECTACULAR SPIDER-MAN name from the short-lived magazine of 1968. With the inclusion of PETER PARKER in the logo, this made for a very long title. Much too long in my opinion. 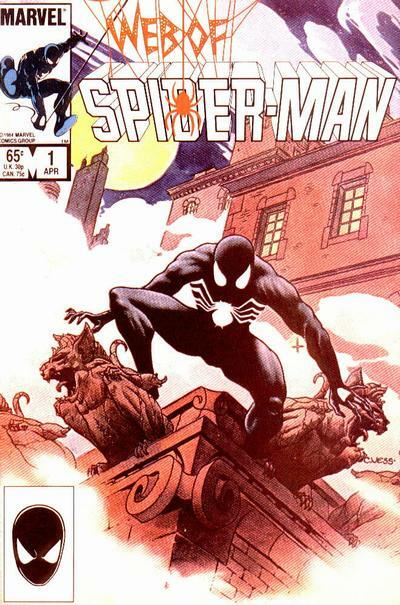 But, by emphasizing SPIDER-MAN, this still sells the concept pretty well. A more traditional logo approach has SPIDER-MAN in mostly squared-off block letters (except for the S) with a three-dimensional arced curve and a telescoped drop shadow receding to a single vanishing point centered and below. THE SPECTACULAR follows the same arc, and PETER PARKER cleverly fills the space between the trade dress banner and the arc below it. The most unusual thing on this logo is the K in PARKER. An original design for that, but it works. Something about the letter forms on this logo suggest to me it was designed by Jim Novak. Long time Marvel staffer Michael Higgins agrees, and tells me that Novak was on staff in the bullpen at the time, making it very likely his work. I haven’t been able to contact Jim to confirm this, but if I do, I’ll amend this section with the result. A few years later, in 1980, the logo was made more compact by putting the first two lines together. The title is still much too long, but this leaves more room for the art, always a good thing. Don’t know who did this amendment. The only other continuing Spider-Man title to debut in the 1980s, as far as I can discern, is this one, a digest-sized reprint book. Surprisingly, they went with a new logo, which again is a rather standard super-hero approach, but I like the open sides on the S and N, the stark shadows on the telescoping, and the accurate and effective two-point perspective. 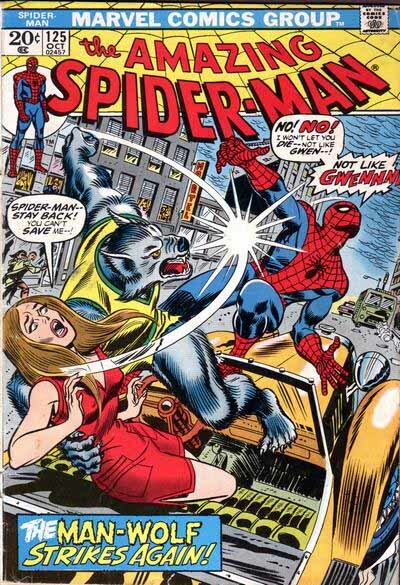 Through the 1970s and 80s Spider-Man one-shots, team-ups and miniseries came and went. I don’t have time to cover those here, but most of them used minor variations on the original Spider-Man logo. That helped keep the brand unified, always a good idea. As the 1990s began, the entire comics industry was undergoing a boom period, and Marvel continued to expand their line. Styles were changing, and a new logo for Spider-Man, one I had a lot to do with, was on the horizon. See the comments for my thoughts on this logo. This entry was posted in Logo Studies on March 3, 2008 by Todd. The one major book that I can think of from the 80s that your missing is Web of Spider-man which started in 1985 and lasted till 1995. It had two different logos that I can remember in the 80s. 1. The first one had the “Web of” done as a an actual web that was hanging off the top of the book and “Spider-man” below it. The Spider-man section was telescoping upwards. 2. The second was more in the line with the Amazing Spider-man logo you talk about here, with the upward arching block letters and a drop-shadow on Spider-man. Thanks, Louis. I did miss that, and it solves the mystery of the digest logo. I thought it odd they would do a new one for a digest, and in fact they used the one from WEB OF for it. 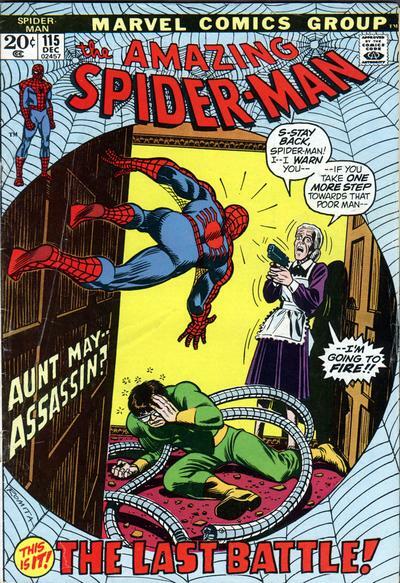 It also has the first use of an actual spider in the logo. Later it reverted to a variation of the original Spider-Man logo, but this one is interesting. I’m putting the cover image into this section. Enjoying this, as ever. For me, nothing beats the classic version, with complex webs. 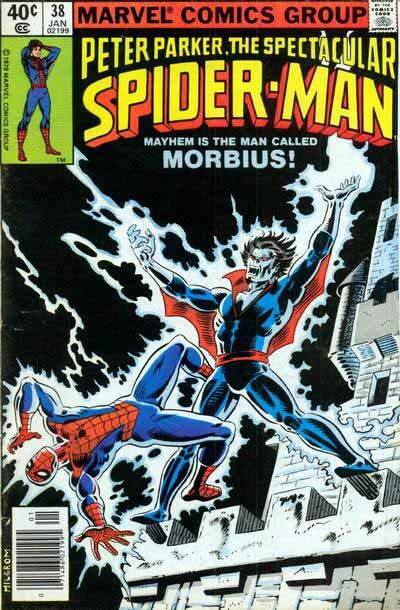 What, no love for my favourite Spider-Man comic book as a little kid, Spidey Super Stories? Well, actually, I can understand why you didn’t include it but I always loved the logo (the second, fatter version more) with the Spider-Man symbol dotting the I!